You need to have peace of mind. Complete counseling services by compassionate and experienced professionals to assist you in planning for your future and that of your baby. Designing your adoption plan — We understand that each person has different needs. We offer you the opportunity to choose and meet the couple that will adopt your baby. Ensuring quality medical care If you do not already have a doctor, we will help you find a doctor who understands your emotional, as well as your physical needs. The full services of a hospital with a supportive staff will be there for you at the time of delivery. Adoptions With Love will cover any uninsured medical expenses when you complete the adoption. Housing assistance We can pay a deposit and several months of rent. Financial assistance with utilities, phone, maternity clothing and other necessities, as needed. Legal assistance provided by experienced lawyers who specialize in adoption. Making sure that the rights of all those involved in the adoption process are respected and upheld is our utmost priority. Ongoing Contact through pictures and letters from the adoptive family of your child over the years. These letters and pictures are always available to you if and when you want them. You are also welcome to send letters, pictures or gifts to the child and the adoptive family. You can design an adoption plan to have ongoing face-to-face meetings with your adoptive family or maintain contact through the agency. The choices are yours. Ongoing Contact also means Adoptions With Love is here for you now AND in the future. Many women choose to stay in touch with us over the years. 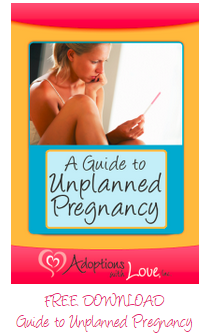 If you are facing unplanned pregnancy and looking for more information, assistance and support, follow the link below for our full Guide on Unplannned Pregnancy. We are here for you every step of the way.